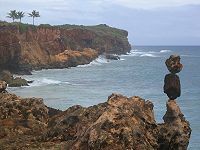 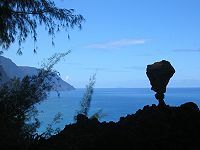 Unlike the Big Island of Hawai'i, where the raw, incessant activity of Pele can be seen everywhere, ancient Kaua'i has been volcanically quiet for over 500,000 years. The continual rains of Mt. 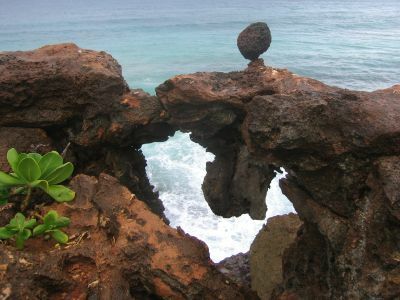 Wai'elele (at 300in/year, the wettest place on earth) provoke more traditional worship of Kane and Lono, apparently unconcerned about the disturbance of ordinary rock. Accordingly there are no "No Stacking" signs found on the island, and -- paradoxically -- fewer stacks. 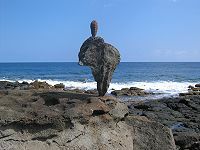 The image above was the only closely accessible evidence of authentic local practice discovered by this site's webmaster, though it was over a cliff, and above a pounding surf. 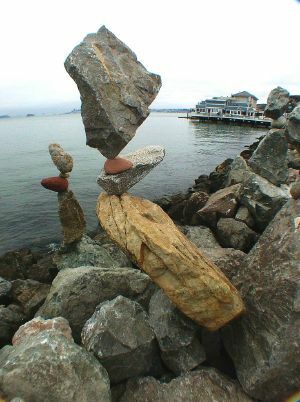 Aside from the occasional trail cairn and the deliberate constructions by would-be balance artists, the only native and local examples appear at dizzying heights and impossibly perilous locations. 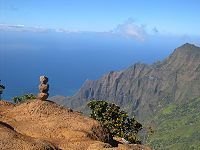 The heading image on the Hawai'i page is of just such an inconceivably challenging place (Waimea Canyon) to carry a large rock, much less put it upon another perhaps brought by a previous worshipper/challenger.